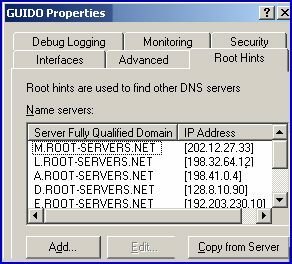 Root hints are pointers to top level DNS servers on the internet. Every Windows server comes pre-configured with a physical file called cache.dns. Inside cache.dns are the IP addresses of a dozen ‘well-known’ servers which hold information about the .com, .net, .org and other top level domains (TLD). You can inspect this file in the %systemroot%\windows32\dns\samples folder. 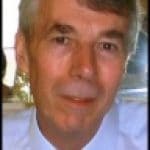 I know it’s obvious but you have to be connected to the internet to take advantage of root hints. The point is that if your DNS server is not connected to the internet then you these root hints are a liability as they will not work and only introduce time delays while queries try and contact unreachable IP addresses. Where your server is not connected to the internet you need to take action and create a ‘.’ domain on your DNS Server. You also need this configuration if there is a conflict between your local domain name and domain name on the internet. The solution is simple and elegant, create a local ‘.‘ root domain. All that you need to do is expand your DNS server and right-click Forward Lookup Zone, choose New Zone, and name it ‘.‘ (some call this character a dot others a period). The result of your configuration is that when you return to examine the root hints, there are no servers listed, the Fully Qualified Domain Name box should be ‘greyed out’. When managing your DNS Server there are many instances when restarting the DNS Server produces the desired effect of a refresh. The easiest way to restart DNS, is right-click the Server Icon and select All Tasks. Sometimes when troubleshooting, in desperation you start ripping out configurations that the server needs. If you made a mistake, or circumstances dictate that you need to recreate those original root hint pointers, then simply delete the ‘.‘ domain. 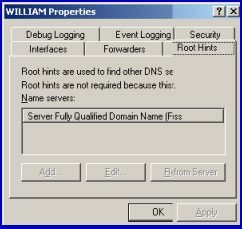 Root Hints provide a link between your DNS Server and top level DNS Servers on the internet. As these IP addresses remain constant, Microsoft automatically load them into your DNS Server’s root hints. All is well unless your server is not allowed to connect to the internet, in which case you need to configure your own ‘.‘ local Root domain.